Kelowna is known for being one of British Columbia's best ski resorts, with 118 challenging runs for all skill levels and kilometers of natural space surrounding the resort town in every direction. While the Okanagan Valley's cerulean lakes, green fields and forests, golden vineyards, and lush orchards are major attractions in the summer, this is a prime winter destination as well. One of the region's premier magnetism is the beloved Big White Ski Resort. Located more than 1,700 meters above sea level, this world-class resort is home to excellent shopping and dining as well as some beautiful residences. The Big White real estate market is the perfect place to start looking for a gorgeous vacation home or year-round retreat. Spacious chalets, modern condos, and convenient slopeside abodes are all abundant in this scenic mountain village. Less than an hour away from Kelowna, the homes of Big White are ideal places to relax and recreate in a stunning alpine setting. Explore all Big White real estate listings below, or keep reading about Big White ski homes for sale! Enhance your Big White real estate search by taking a moment to sign up for an account with Vantage West Realty. You'll be able to access our advanced search features to discover and save listings. You'll also receive notifications on key properties so that you can gain an edge over the competition. 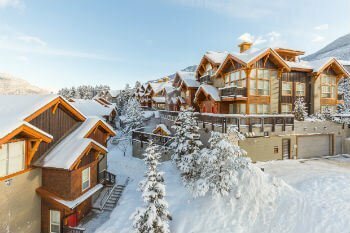 Big White ski properties for sale include both single-family detached homes as well as beautiful condominium complexes, all crafted in classic alpine architectural styles. These homes generally range in price from less than $150,000 to close to $1,000,000. The condos and detached homes both feature lovely vistas of the village or of sweeping mountain landscapes. Their design reflects features that have come to be closely associated with the ski resorts of western North America: natural stone cladding, rich timber beamwork, sloped eaves, and large windows. The result is an earthy, woodsy, and semi-rustic flair that exudes coziness and enhances, rather than detracts from, the natural alpine landscape. See all of the current Big White condos for sale now. Big White homes for sale typically feature gorgeous, meticulously crafted interiors that demonstrate the same high quality, lodge-style elegance as their exteriors. Some feature entirely rustic finishes, with knotty wood paneling, plush carpet, and timeless colour palettes. Others include a dash of modern flair with stainless steel appliances, tile backsplashes, sleek pendant lights, and steam showers. High, vaulted ceilings are classic fixtures, while the spacious balconies and hot tubs of Big White's luxury ski homes are ideal for après enjoyment. Life in Big White is all about recreation, relaxation, and enjoying nature. With adventure right outside their doors, Big White homeowners are truly spoiled. In the winter there is world-class skiing and snowboarding, skating, and dogsledding. In the summer, the resort is a hub for hiking and mountain biking in the presence of unspoiled mountain views. Fun social events light up the village and keep social calendars jam-packed. In addition, the incredible restaurants, bars, and pubs offer up plenty of opportunities to try appetizing dishes or cozy up with a pint after a powder-packed day. Shopping, spas, and fitness centres embody the active yet laid-back vibe of Big White — the perfect blend of serenity and thrill. And while its easy to experience much of what the mountain has to offer in a day trip from Kelowna, nothing surpasses the convenience and sense of belonging that comes with owning your own home here. 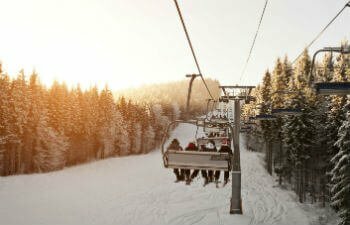 Connect with your Big White ski home experts at Vantage West Realty today! We'll work with you to find your perfect vacation property or dream alpine home. Start your journey now by giving us a call at 1-250-717-3133.